Art journaling is fun – or at least it should be! But sometimes you avoid doing it because of the dreaded “blank page”! The truth is, sometimes while creatively exploring and expressing yourself with art journaling, you just can’t figure out where to start. Believe me, I’ve been there! So I’ve come up with these five fun art journal ideas, along with some different ideas for how you might use them in your own unique ways. So that when you’re facing a blank art journal page, you’ll know exactly what you want to do. So gather your supplies, and let’s get started! Fun Art Journal Idea #1: Journal about the current season. How to implement this art journal idea: Each season has its own unique traits and qualities, just like each individual art journaler has their own talents and skills. When journaling about the season, you can use your same go to tools and supplies, or try something new! For example, as I write this, it’s Fall here in Portland. If it’s Fall as you’re reading this, try taking a walk and gathering fallen leaves. Use them by pressing them in your journal and writing around them about what you love about Fall (or Autumn, if you prefer!). You could also find a quote about Fall to include with your leaf or leaves. It’s also fun to use fallen leaves as “stamps” by covering them with paint or ink and pressing them into your journal as a background. Or simply as a complete page for minimalist art journalers! Alternative: Not feeling inspired about the current season? Journal about your favorite season instead! Fun Art Journal Idea #2: Journal about color. How to implement this art journal idea: Color! It’s such a fun topic in itself! And there are so many ways to include color in your art journals, even if you tend to shy away from it. For instance, you could create a collage of color from clippings from a magazine, mixed with vintage ephemera, scrapbook papers, or whatever colorful bits of paper you have in your stash. Do you love washi tape? (I’m not an extreme washi hoarder… just yet!) Why not create a page with samples of every roll you have? Or “write” the word COLOR with samples of your most colorful rolls. Alternative: Did you just buy a big set of brush pens, a watercolor set, Souffle Pens, Posca paint pens, etc.? Fill a page with every color that came in the set. (I made a “junk journal” just for collecting color, and you can watch me flip through it here.). Fun Art Journal Idea #3: Journal about the place you live. How to implement this art journal idea: Last time I was at the airport, I realized that there was a huge stand of free tourist magazines. These weren’t flimsy fliers (though those could work, too! ), but high-quality, glossy magazines with gorgeous photographs or my beloved city, Portland, Oregon. (If you visit PDX you can find them downstairs near baggage claim.) I’ve used those to create an entire journal just about my city. And now, when I’m visiting other cities, I look for them there, too. You can also collect menus, ticket stubs, stickers, receipts, local magazines, photographs (I love how you can print small 2″x3″ photos on the go with Sprocket Portable Photo Printers) and then write about your experiences. You could also draw your favorite parts of — or spots in — your town, and write about why you love them so much. Alternative: If you could live anywhere (else) in the world, where would you live? Journal about that place, and how it would feel to live there. You could collage in actual photos or illustrate it yourself. Art Journal Idea #4: Journal some faces with collaged hair. 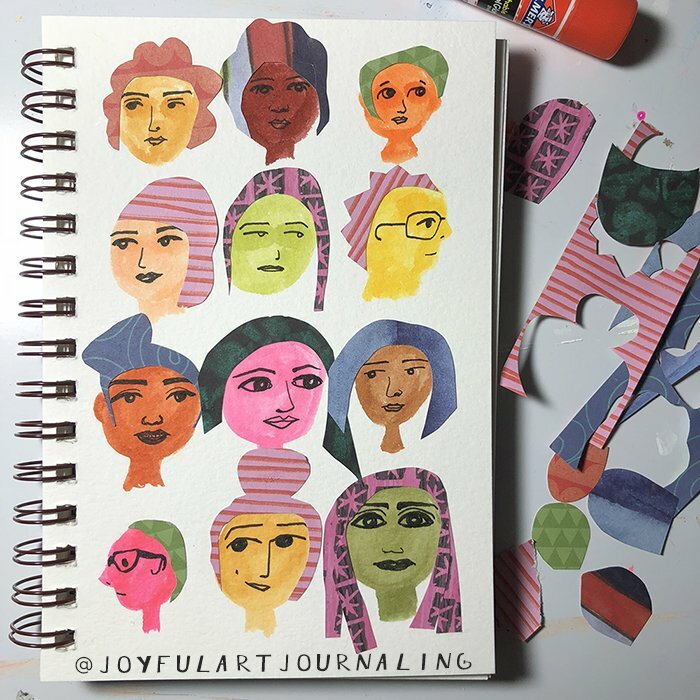 How to implement this fun art journal idea: I love drawing faces – from doodles to fairly realistic portraits, they are one of my favorite things to draw. But sometimes the hair gives me trouble. So I tried cutting out “hairstyles” to add to my doodle face drawings, and voila! I think they turned out pretty cute! 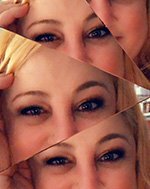 You could do several, like I did, or spend more time on one face, and add a collage “wig” to that one. You could also draw your family, your friends, or your favorite musicians, etc. this way. Alternative: Cut out (just the) face (or faces) from a magazine, and draw the hair on top instead! Art Journal Idea #5: Journal about your favorite food. You can draw or paint your favorites, or collage them. You could even hone your hand-lettering skills and include the recipe. 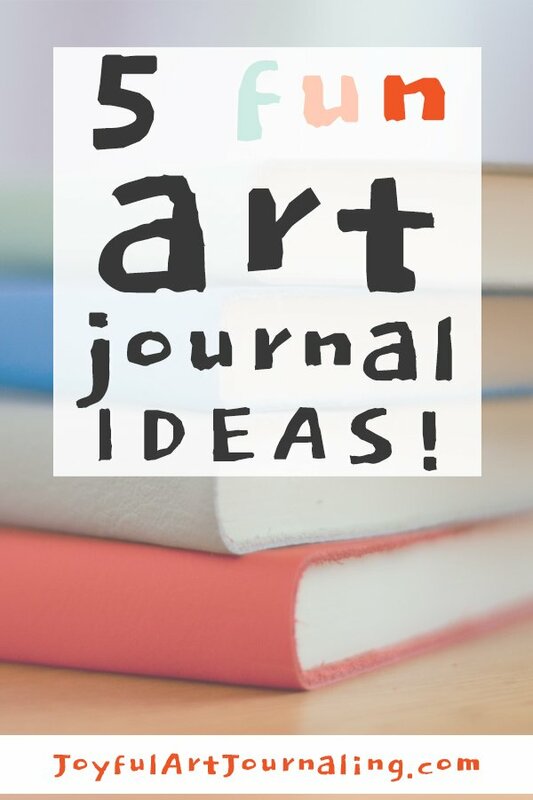 Looking for even more fun art journal ideas? Check out some of my favorite art journal books, like Journal Sparks and The Painted Art Journal. See my list of recommended art journal supplies here. And be sure to sign up for my email list so I can let you know when my forthcoming book, “Joyful Art Journaling: 30 Days of Joyful Art Journal Prompts” has been published!